Congrats to Shamara Glover(Guilford High) for being selected to the All Tourney Team in Romeoville for their Turkey Tourney this past weekend! Great Job, Keep up the good work! 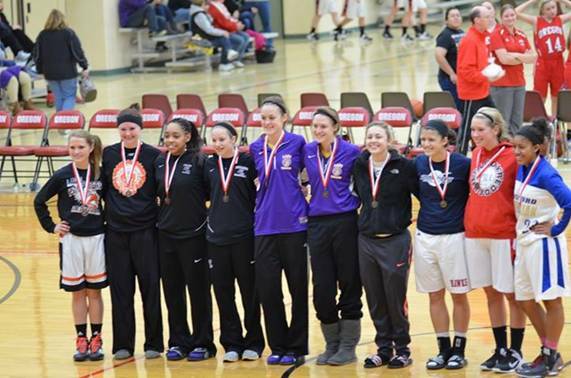 Rockford Heat Players Selected to Forreston Turkey Tourney All Tournament Team! Congratulations to Rockford Heat players Lexis Macomber, Maggie Curry, and Linzy Keller for being selected to the All Tourney Team for the Turkey Tournament in Forreston. Rockford Heat Player Get Nice Write Up for Upcoming Season! Nice article about Heat player Kea Whittington and the upcoming season for Beloit Memorial! Good luck and keep up the good work! Rockford Heat Players Selected to Oregon Tip Off All Tourney Team! Congrats to the Oregon Tip Off All Tourney Team. Two Rockford Heat Players, Jayla Penney And Samantha Lambrigtsen were selected to the All Tourney Team. Great job to all selected, keep up the hard work! Rockford Heat would like to wish all its players, parents, coaches, and fans a Happy Thanksgiving! Enjoy time with family and friends! Congrats to Allison Hasken(8th Grade Team) and Nya Taylor(7th Grade Team) for being selected as “Highlighted Players” of the Bison Turkey Shootout tournament held this past Sunday. Great job ladies, keep up the good work! Rockford Heat 8th Graders take 2nd Place! The 8th grade team took 2nd place this Sunday at the Bison Tournament. They went 2-1 this weekend with wins over Sycamore Fury and IL Premier, and having a loss to North Boone! Nice jobs ladies, keep up the good work!